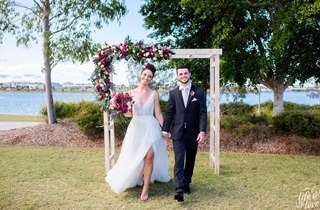 Surrounded by acres of established grounds and positioned beside beautiful Brightwater Lake, The Lakehouse Sunshine Coast is an American Hampton’s inspired, waterfront wedding venue for your wedding ceremony and reception. Conveniently located 5 minutes drive from Mooloolaba Beach, 15 minutes from Maroochydore Airport and just one hour from Brisbane, the venue is family owned and operated by Kellie and Scott Armstrong, elite hospitality professionals with a combined 40 years in the industry. Our room is a mix of plush deep carpet, luscious wallpapers, antler chandeliers and an eclectic mix of classic and country furniture with a slightly distressed finish. With tones in grey, charcoal, slate, black, white, ivory and pewter, this beautiful room provides the perfect backdrop for your own décor and style and will fit with any colour scheme.